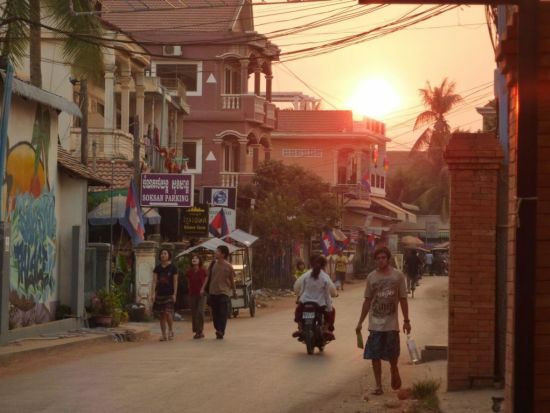 A street scene in Siem Reap in Cambodia. You never get sunsets like you do in SE Asia and this is an example of street life as the sun was setting. 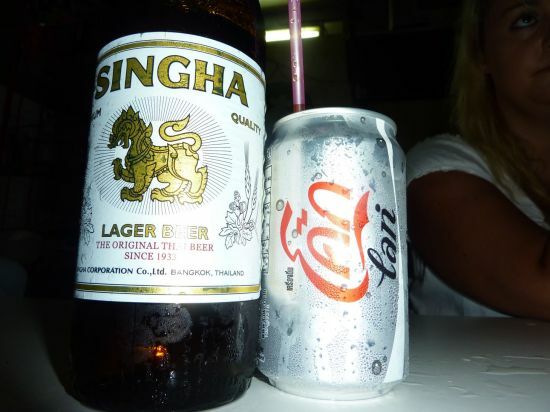 Lovely small town with great bars, cafes, restaurants and of course the Temples of Angkor. 40+ Degree heat and no air con or water is not fun. Conked out from the power cut, G tries to find some refuge on the cold tiled floor with not much on as a long night of 40C with no air-con or electricity kills us. Disgustingly sweaty, we both jumped into the pool the minute the sun came up to try and cool down. The bad luck continued the following day with an unsuccessful night bus knocking someone down, a 4 hour wait for the next bus in the middle of the night, a rocky and speedy journey on the second bus which then broke down and just about now if you look above to the pic…you can see my pissed off face. Yup this was my breaking point….almost 15 hours after we left Siem Reap… nearly died.. two or three times in one night… I lose it 15 km away from our final destination. I would have walked it just to eventually get there!! 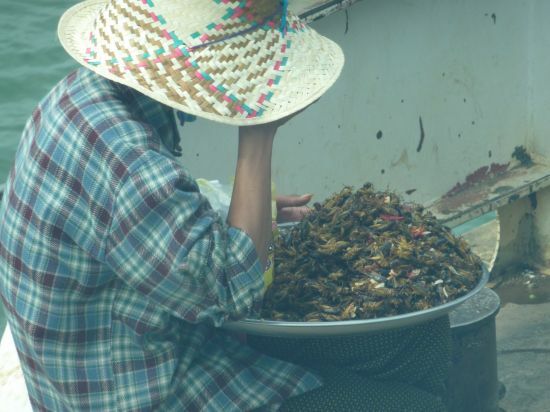 This woman is having a snack on some locusts at the border crossing of Cambodia and Vietnam. As delightful as they look, I just wasn’t in form for them that day.